When the French arrived in Detroit in July, 1701, the Ottawa Indians called this island Wah-na-be-zee meaning Swan Island. The early French settlers near Detroit used it as a place for their pigs to graze, thus giving it the name Île aux Cochons. Supposedly, the marshy island was once home to many rattlesnakes, but the pigs did for this island what St. Patrick did for Ireland. I do not know if any of the early French residents formally owned the island. The French settlers generally interacted with the Indians in a much less formal way than did the British. After the English military in North America defeated French forces in 1759 in Québec City and Montréal in 1760, the British—in November of that year—replaced the French as rulers of the Upper Great Lakes. They sent a small number of troops to occupy the French fort in Detroit and a few—very few—English settlers followed. The British emphasized land ownership rights. In 1768 British Lieutenant George MacDougall purchased Belle Isle from the Crown for 194 Pounds. Apparently, the Ottawa and Ojibwa Indians asserted ownership of the island. MacDougall may have recognized the legitimacy of their claim, or the British authorities may have wished to placate the Indians. In any event, MacDougall on June 5, 1769 provided the Indians with 8 barrels of rum, 6 pounds of vermillion, 3 rolls of tobacco, and a wampum belt and they relinquished their claim. The story does not end there. Local residents were accustomed to letting their animals graze on the island and thought that it should be common property. They protested to the local British administration who upheld MacDougall’s ownership rites. In 1773, the British sought to count the number of residents in the Detroit area. Apparently five individuals or five families were enumerated as residents of today’s Belle Isle. In 1794, William Macomb, a British settler who is commemorated by the neighboring suburban county’s name, purchased the island from the heirs of Lieutenant MacDougall for 813 Pounds. In 1811, William Macomb died and his son, David, became the owner of the island. Six years later, Barnabas Campau, a descendent of one of the early French families, purchased the island for $5000. Barnabus Campus died and his widow—Alexandrine M. Campau—married R. Storrs Willis in 1864. He was a Detroit real estate developer whose name is memorialized in the Willis-Selden Historic District. He was also interested in music and collected art, some of it donated to what became the Detroit Institute of Art. 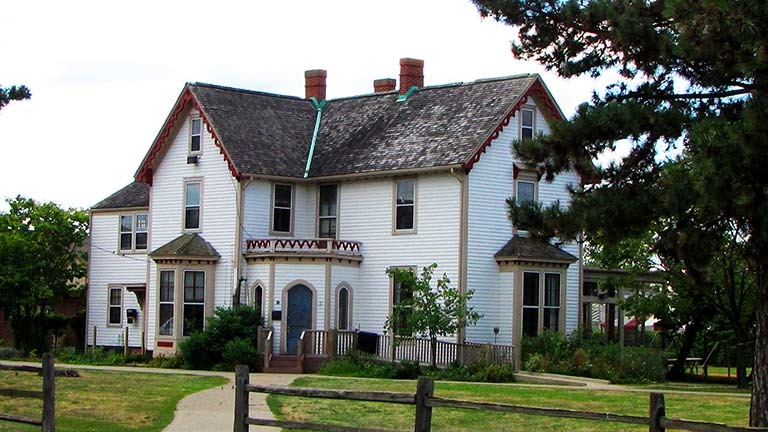 They are the ones who built the attractive, well-maintained Victorian Style home that is pictured above. There is another element. By the 1840s, English was well along in replacing French as the lingua franca in Detroit. Île aux Cochons may have already been translated to Pig Island by that time. However, the name was more or less officially changed to Belle Isle. I have heard two stories about the selection of that name. Lewis Cass had served as Territorial Governor, moved on to become Secretary of War in the Jackson Administration, and then served in the US Senate representing Michigan from 1845 to 1848 and later was a Democratic Party candidate to become president, but he lost the 1848 election to Zachery Taylor. He was very active in Detroit and Michigan political circles for years. I have heard that he selected the name to honor his daughter. However, I have also read the name was chosen to the Count of Belle Isle who was the physician traveling with Antoine Cadillac’s party when he settled Detroit on July 24, 1701. In 1879, the city of Detroit purchased Belle Isle for $180,000. I do not know, however, if those funds went to the Mr. Willis and his wife. I thought that the city of Detroit had to negotiate with the state government for the right to own Belle Isle and use it as a park. It may have been that the state legislature had much more authority over cities at that time than at present. The Home Rule Law of 1911, I believe, greatly increased the prerogatives of Michigan municipalities. Perhaps the state legislature, prior to 1911, had much more control over cities. For example, it was the state legislature that, in 1870, established Grand Boulevard in Detroit to separate a densely settled urban area within the ring from a rural area outside Grand Boulevard. At some point, the home you see pictured here was taken over by the administrators of Belle Isle for their office space.